At running back, the Denver Broncos see themselves without a glaring need, but adding the likes of Rex Burkhead gives them added punch offensively. The Denver Broncos find themselves in a new offense tailored to the players and of the up-tempo variety. In this offense, the Broncos must find a ‘move the chains’ versatile playmaker to help pick up the slack if they struggle like they did in 2016. Under the watch of Mike McCoy, the team might consider a run at Danny Woodhead in free agency. Due to recent injury history of Woodhead, Rex Burkhead may also find himself on the radar of the Broncos. Burkhead attended the University of Nebraska for four years, racking up over 20 awards with the team. According to coaches, media, ESPN and Phil Steele, Burkhead was named first-team All-Big Ten in 2011. In 2012, Burkhead wrapped up one of the more illustrious, all-around careers at the university. The same university that has Johnny Rodgers, Mike Rozier, Tommie Frazier, Eric Crouch, Scott Frost, Roger Craig and many others. Burkhead ranked in the top five all-time in rushing at the university. Fast-forward to the 2013 NFL Draft, where the Cincinnati Bengals drafted Burkhead in the sixth round in hopes to add depth at running back. 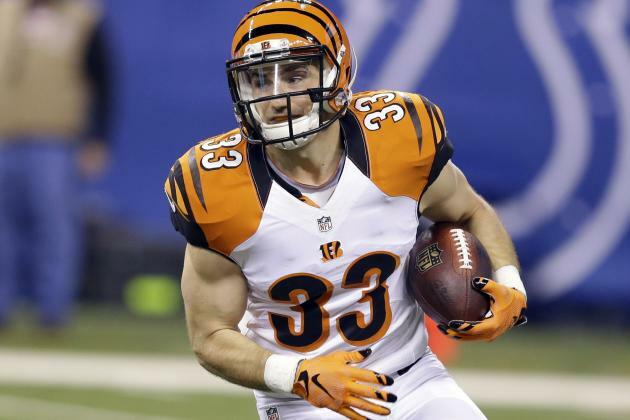 The problem for Burkhead with the Bengals became the people in front of him. Jeremy Hill and Giovanni Bernard are both terrific backs on their own because of the versatility they possess. There is a slight connection with Vance Joseph, who was the defensive backs coach with the Bengals from 2014-2015. He may not have coached the offensive players, but as a former quarterback himself, he understands the importance of a running back as a safety valve. Now that he is a free agent, Burkhead may be one of the more under-the-radar and high impact player the Broncos could target. There is plenty to like about Burkhead if you are a Broncos fan. He is a slasher of a runner, but is not afraid to mix it up and become a physical back at the point of impact. One of the knocks on Burkhead since coming out of college has been his pass protection. He has all but eliminated the doubt there and added that as a strength. Every person I spoke to about Burkhead said his pass protection has taken a significant leap since entering the NFL. Pass protection became an area of concern for the Broncos both on the offensive line and at running back. If the Broncos sign Burkhead, the pass protection at running back instantly becomes better. Much like Woodhead, Burkhead is valuable out of the backfield and as a runner. Right now Burkhead is proven to be more durable than Woodhead because of injury history. Certainly familiarity with Woodhead and McCoy is a potential factor the Broncos might look at for the running back position. He is a slasher, but also shifty out of the backfield. The Broncos do not exactly see themselves in serious need of a running back, but with the emergence of the Atlanta Falcons and how they used multiple backs, it is hard to ignore. Despite rookie struggle, Devontae Booker is still the future back in my eyes. Meanwhile C.J. Anderson adds the perfect ‘bowling ball’ compliment runner when healthy. Kapri Bibbs deserves a shot, but will it be with the Broncos? Time will tell. Signing Burkhead gives the team three different skill sets at running back and all of them will still make impacts on the field. Yet, Burkhead stashed away on a talented Bengals team makes him an intriguing player for the Broncos to consider in free agency. If it were me, I would rank him higher than Woodhead and make him a priority to look at in free agency..